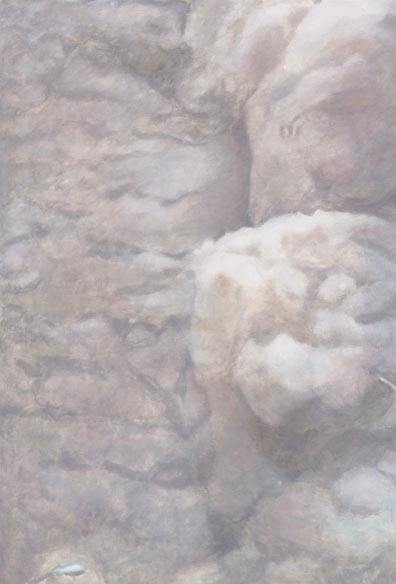 Gary Wiseman: It has been said that it is impossible to place you within a school of painting. However, you have been extremely influential and could be seen as having established an entirely new school of painting. What is the philosophy of the Luc Tuymans school? What is its lineage? 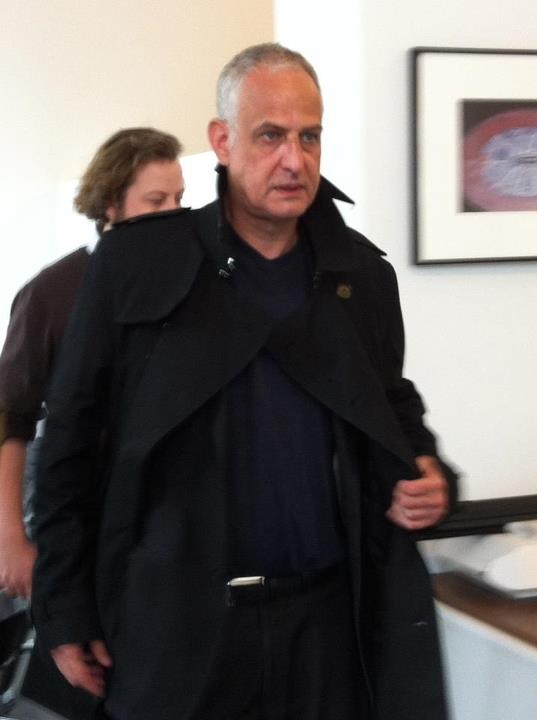 Luc Tuymans: Nothing, I hope, because I am not planning on making a school. 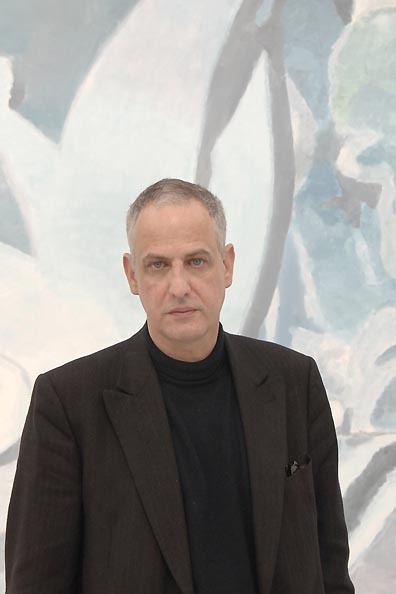 Even the article, I mean, though well meant, about the Tuymans Effect [Jordan Kantor], I thought it was a bit difficult, I mean, it is not because of the fact that ten years later Havekost crops the face of which he makes a portrait the same way I did, that it is the same painting. Because it is painted totally differently. The same goes for the other people in that article. So I think that is really much more of a thing for the people who busy themselves with that, actually. The people who try to put their finger on it, who try to consolidate something through it, who try to find some kind of logic, I don't know, as they did with isms and so on in the earlier days. I think that really doesn't play out anymore. I think that Iâ€™ve had an influence, for sure, that is also something that I have to admit, because I have witnessed it, also witnessing it, but to create . 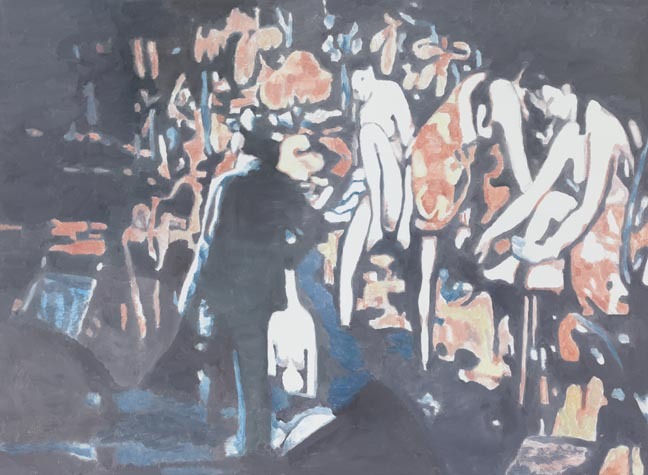 . . Once, for example, I was asked by Herman Pitts, who is now Director of the Academy in Munich, to start up the Tuymans classes, to start a school. The Germans have this weird thing going on, they are also followers, of course. They create these clones [laughing] and to say that I also cannot be, I mean, in a way, put into one category, which is true and not true to a point. Of course, one should not forget that there are also predecessors and, I think, although it's never been an influence on me, like in the work literally, but I think especially a guy like Gerhard Richter was responsible for opening up, also, the road a little bit in that sense, which is also an evident story for Gerhardt Richter himself. He actually had an impact on photographers, also. So you have to make that, certainly on a European level, that it is something that happened before me, and was happening before me. 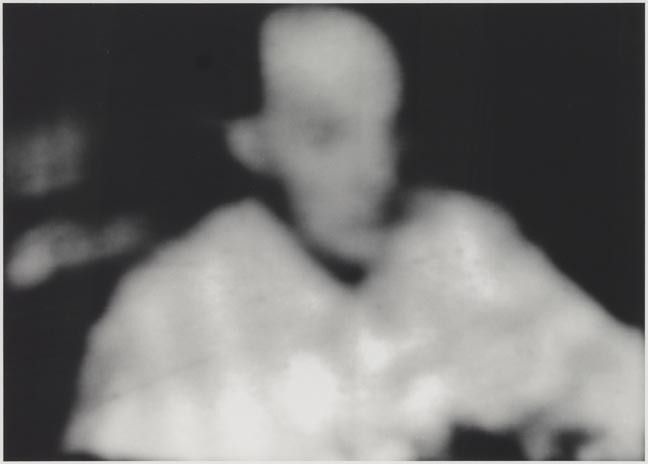 So there is always, probably, a lineage you can be, and the first of course, the first remarks, the first attempts to categorize the work was in accordance to Richter, the one very big European painter they knew. GW: That was the second part of my question, regarding the lineage, it seems you have partially answered it. You touched on this previously, but I am still curious. How you feel about being so widely imitated? LT: Well, I think that, I mean, it doesn't disturb me, but I think that it should be disturbing for the people who are doing it, I mean, because you have to figure out your own thing, I think. If I could be an influence in finding that way, fine, but just the influence of being monkeyed after then, no. I mean that's of course something, even when I was teaching in Kessel, that was one of the first things I made clear to the students, that that was not the issue, that was not the point. 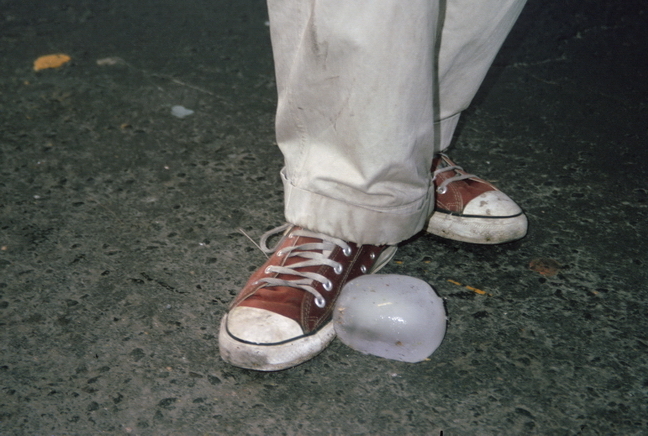 GW: The next question regards Still Life (2002), shown at Documenta 11, which focused on political commentary in art. . .
LT: Yes, that is also what I thought I shouldn't do. So I purposely went for actual icons within painting. The biggest one was the lowest denominator, which was the still life as a category, but also over-sized and unconsumeable [sic], and even more pregnant in the small space that it was not forseen to be in. But anyway, so, and of course people like Sarat Mahara didn't understand that and Okwui [Enkwezor] to a certain point was annoyed by it because most of this Documenta was about the element of the witness stand and I think the reason he picked me was also partially because of this, this Congo series (2000) and the Belgian pavilion, but in the Belgian pavilion it made all the sense in the world because that was, first of all, as I said, Iâ€™m not a political artist, but in that pavilion it made sense because that room was built by a colonial architect and so, therefore--and also there was another really important element that made me decide to make especially that still life. That was the idea of 9/11 because my wife and I were there in the States when it happened. So, the only thing that could oppose that kind of horror, just cooped in a hotel room, can't go away, see the planes going in from I don't know how many angles on CNN. All these people that, like 40 suspects, 40 dissidents, like hours, less than, within minutes of what was happening, and the atmosphere itself. So, my idea was also--later I did it maybe indirectly with the Demolition (2006) painting and the Condelisa Rice (2005) and that's not, also, an image that comes straight out of 9/11, but of course, it is immediately referential in the States and New York itself. So, therefore I tried, what could, what could one oppose this with? So, I came to the element of the idyllic, which is basically the painterly element and then I went for--the first idea was more like, sort of like the, ah, the old school geometric landscape from Poussin--but then I thought that was too far-fetched and went for this idea of the over-sized, over-blown, nearly projected because it was also taken away in terms of contrast on sort of blue-white fields of this, of this, still life. A lot of people, some people totally understood it, I mean like Hannes Wader went in to the space and laughed his head off; people like Sarat Mahara, although a writer and everything, didn't understand anything of it, and so, too, a lot of critics now. Until the point when a still life eventually turns up again in the Tate Modern, where people like Charles Esche start to understand a bit better what the understatement of the whole thing was. The other thing was that I didnâ€™t want to be put into this grid. A lot of artists were put into in that Documenta of the testimonial stand. I thought that was, was too reductive for art. I also, therefore, respect Stan Douglas, although being black, not also going there. Then other people like Orosco making nearly a joke out of it, so that very. . . those artists I also thought really, and truthfully to the matter, distanced themselves, whereas people like Steve McQueen, of course, went all out, which may also not be unlegitamate. The thing with Okwui's Documenta was, that is, of course, there were also a couple of people that were not invited in Documenta, like people out of Senegal that I knew from artist groups and all that. [They were] not properly visited, of course. Nevertheless I think Okwui gave a gigantic platform, and especially also for film and video, in a very good way. I mean, I think, at least his Documenta was the Documenta that, yeah, that took on a certain issue, but that was not my issue therefore I didn't take it, and also the fact that this was opposing the issue, as being white and part of Western culture. This is how it had to be perceived and I think it has been like that, but of course it has not been swallowed. Therefore the idea of this still life. . .
GW: Still life as a subject often references property as. . .
LT: Yeah, and it references food and nourishment and it also has, of course, sexual connotations, there has been the whole iconic play. 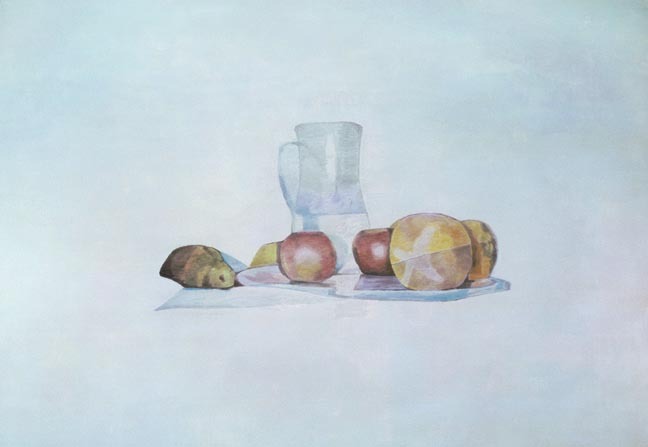 Although my still life was quite plain because it was one that I put up in my studio with a couple of sheets, loosely, of course, still in my head, a very small, unfinished, on a light blue, also, backdrop, from ah, Cezanne. GW: Still Life has been described as 'a monument to the inadequacy of language.' Another Belgian painter dealt with the problem of language. I am referring, of course, to Magritte. . .
GW: You mentioned earlier that, and from what I understand, you usually work from photographs and films? LT: Not always, but, I mean, like there are works like the Schwarzheide (1986) which is based on a drawing or Our New Quarters (1986) which was based on nothing but the moment itself, no, it was based on a postcard, but yeah. It's always through found imagery which then, of course, is altered until it becomes appropriate to paint because not everything is paintable, so to speak. Most imagery already exists, basically. So, it's not that I'm like Neo Rauch, who says that he actually, sort of, through dreams and through working on the canvass directly starts to come up with this imagery, which I actually don't believe [laughing]. If you look close at those paintings they're quite constructed, so I think there has been a lot of time and effort going into that before, not just in the moment I think. GW: You spent time working with film and video. How does that affect your work now and. . .
LT: Oh, decisively, of course. I mean before, there's still a couple of paintings left from the end of the 70's and beginning of the 80's, and these paintings were much more tormented, very existential. This is also why I wanted to stop for a while because it became suffocating. By accident someone showed me, a friend of mine showed me a Super 8 camera and immediately I turned it into, like, a daily practice. From there on they took the Super 8 400 ASA, which was a fantastic quality, you could actually, when it's dark with just an office lamp you could film, but they took it out of the market and only used it for scientific purposes so I had to go to 16 mm. I was really planning on making a 35 mm, like a long feature movie. Which, of course, I couldn't pay for, but . . . there is still like 15-20 minutes [of footage]. These things never ended or added up to something that would show well. I showed them, parts and pieces, in the American tour, not all the venues, I showed them in Brussels, but this is sort of a compilation, and was much more made in terms as an announcement or pre-announcement of paintings that were going to be painted, later on, after the film, eventually. What it [making films] did, it created the necessary distance for me to just make an image. That was the most important element and then the other element, of course, closeup, cropping, editing. . .
LT: So, yeah, those are the, those are. . . it changes your vision, if you look through a lens, if you just look around--also the fact that I am already, sort of a product of the television generation, too. So, I've had an overdose on images and lack of meaning, so to speak. I think, much more than photography, this, this element of the moving image has been, and always has [had] since I was young, an appalling effect on me. I remember the very first time I saw Snow White and the Seven Dwarves I was seven and I was horrified because, I couldnâ€™t get it through my skull, I drew a lot already then, that a drawing could be so real that the movement could be so fluid. Of course later on you find out the, just the carbon on real midgets and on real person, and so on and so on, but that point you don't know, so it became very scary, yeah. So the, this, this, this animated element of the image has always been a fascination to me. GW: Are you interested in going back to the moving image at any time? 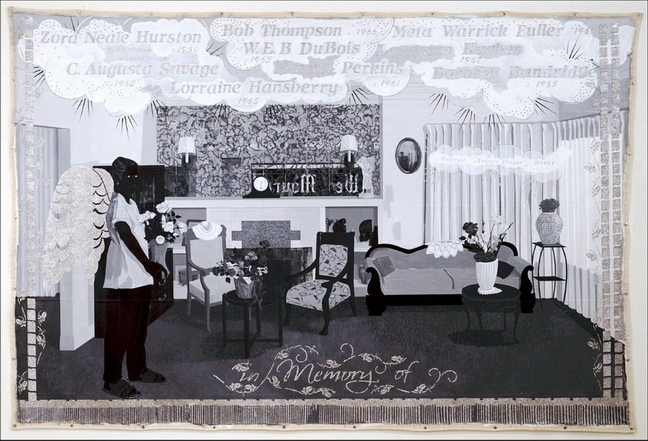 LT: Well, there was one, which is now going to be turned into a series of paintings, but there was one idea, a long-standing idea that I already proposed before, [maybe in] 2004, to Kerry James Marshall, to make a black and white, ah, a black and white animation film. So, we started up but then it sort of . . . well, Kerry James is quite difficult to make an appointment with [laughing]. GW: So, it was animations based on the imagery seen in your paintings? LT: Well, no, it would be, it would be, it would really have to make sense, a double sense, of course, black and white, he's black, I'm white. So there is, even to that level, it should make sense. So, but the idea was to make something out of both of the environments in collision like the building you see over there [points across studio] is a maquette of a drawing that Kerry James made, with a demolition ball. I had similar elements, and so these were then . . . but it doesn't, doesnâ€™t really happen yet, maybe it will happen once, I don't know, but it was also the idea that I would take care of what was happening inside [of the building] and he would do the outside and things like that, but really like old-school with the lines and the shadows. This, this old way of making an animation film, and so I already contacted a studio here that are really great drawers but then Kerry wanted to do it all himself [laughing] 10,000, 20,000 drawings! GW: Do you spend much time these days watching film or T.V? LT: T.V. I don't watch that much anymore because there is nothing to see. . . but I still go to movie theaters, I still rent DVD's to look at or if I want to see something on HBO. Because television for me, through time, has become something really annoying and the more channels you have the less there is to see and also the fact to, to drain yourself in front of this machine is quite difficult. Then, and of course, now you have the iPad, you have other ways of looking at things also, and which are a bit more . . . the way you find your way through it, whereas the other things are a bit more programed. GW: How much time do you spend painting? LT: Well, the paintings are all made in one day. It can be a long day, or it can be . . . some paintings really go without any, they just, some paintings come easily. They just fall out. Other paintings are quite difficult. It all depends and, although in terms of being knowledgeable in the craft of making my paintings, which, in fact, is not that crafty because I don't do glace'. I don't do layering, I just work wet on wet, so the work is very direct but it's very, very um, detailed. So there are no, this was always really a little bit the case, except maybe from earlier works, there's no real big gesture. 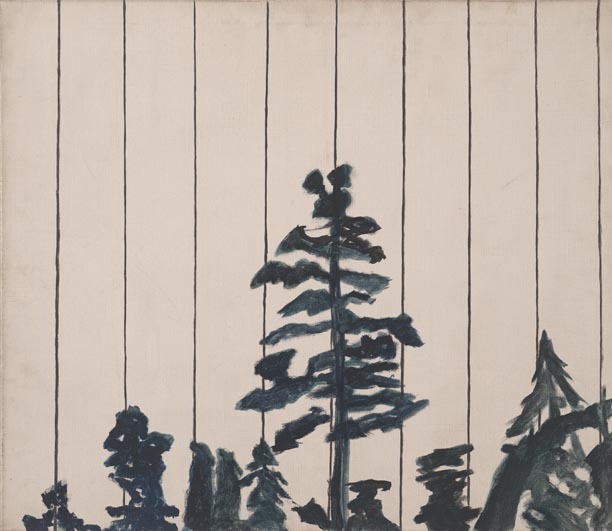 The biggest gesture is maybe the backdrop, just painting it in one color and then already, immediately, the drawing and the gesture sort of click and then to the end it expands with the contrast. But the brush strokes are short, vivid, and nervous, which is the way I want to have them because of the sharpness of it. Unlike Richter, for example, I don't scrape things off, although having been perceived as a blurry painter, the blurriness is super sharp. Everything has to be painted. 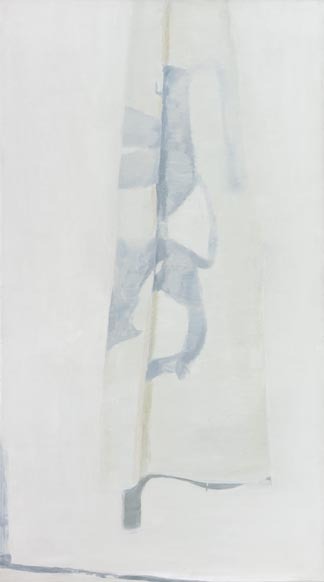 GW: On the Saatchi Gallery website it says that, "Luc Tuymans's paintings delve into the inner workings of how mythology is created." Francis Alys, also an artist with ties to Antwerp . . .
LT: Yeah, he was born here. GW: He deals with similar ideas from time to time in his work such as mythologies and their constructions. Is there something about Belgium, in particular Antwerp, that lends to this kind of investigation? LT: Well, first of all, Francis Alys comes from the French speaking side of Antwerp and proclaims to have this, sort of, special feeling for the city like I do, too. The funny thing is Francis Alys together with Orozco are the two main camps, basically, in Mexico City, and one of them is actually Belgian, which is typical for Francis Alys. The first time I went to, and had my show at, the Museo Tamayo, the museum, of course he [Alys] invited me to his studio and once you entered the studio you were no longer in Mexico City. So there is this very typical way of doing things, I suppose. Whereas it also amazes me that he was able to do that because it's a very individual take on things. GW: Almost has echoes of a colonial . . .
LT: But that's what I actually then don't like, but the problem with Alys is that, the man moving the mountain for example is a fantastic work, but I don't need all the documentation about it. Then the guy with himself with the gun I also thought was. . . then you have all the paintings that some people actually made for him and this is where it becomes tricky for me. This whole way of social environment and using and incorporating. And then there was the one with the ice block and I started to feel something like, 'Has he been to a Jesuit school?' and I followed it through and it's correct. GW: He was at a Jesuit school? GW: Why did you make that connection? LT: But, the ice block, which is actually not a piece of Francis', but it is a remake of another artist who did that [Fabrizio Plessi]. Just the idea of, you know, like, doing this until the ice block is gone, it's like you have to have this procession-like type, these walks, rituals. Then you also have this element of, how do you call it, flagrantissimÄ“ nearly. So this all started to fall together for me that made it a bit more difficult, I have to say. The fact is also that playing with this, like using the word 'revolution' in a gallery, and playing these guns, and playing with this whole element, which is again, of course, a social article element, [to] turn it into something poetical sometimes, not always, deliberately going for a point where you pretend to be full of humility, which is of course not the case. Then, of course, here in Belgium, I saw his show in Wiels which went to, it went to the Tate Modern also then the MOMA where it was totally destroyed by the critics to a point that it becomes a bit too much, also, because, I mean, I think Roberta Smith actually ends her article in the New York Times with something, which I think is a bit too far, she called it "jackass" art. LT: It explains why, I think, a little bit, where the Americans saw through that element which here in Europe is perceived partially because, because of the wrong exoticism in a different way, I think. Interesting, of course, is that you have these two camps, Gabrielle Orozco and you have him [Alys], which actually a great deal of the cultural world of Mexico City is organized [around]. GW: You could live anywhere you wanted but you choose to stay here in Antwerp. Why? LT: One good thing about Belgium is the fact that, since it is not a really cozy environment, that's one thing which keeps you awake to a certain point. I mean my wife [Carla Arocha], when she came here--she's originally from Caracas, Venezuela but lived 20 years in the states where we met--took her six years to adapt to the fact that she thought that we were, at first, pretty boorish, a bad sense of humor, exceedingly rude, and negative, which, to a point, is also really true. I mean, which also, at points this is downscaling things and is counterproductive. On the other hand, Belgium, as a country is very nonentity. Basically, also, it has had always, this sort of prolific element in terms of the individual, less the group. So, on a creation level it's quite inspiring in that sense because there is this huge--unlike in Holland where everything was like, now less of course (which is very strange that it happened from one way to the other) but in Holland everyone would be subventioned, everybody would be pampered, here that's not the case, there was always the fight and there was always the disbelief. So, there was always this resisting point which, I think, still is, and the other thing is that from here you are virtually everywhere very fast, and the fact that it is small, comprehensible--if I were to live in New York it would be totally different. First of all, you would be bothered and buttered more than here. That would be the same, especially in London, it would be the same in Paris, it would be the same in every big metropol where you would then decide, and because, I mean, I would, of course--there are cities where I would [live], which I really like. The one that would be similar to here but would be less difficult, although I donâ€™t know, would be Warsaw, which I quite like because they have a fantastic sense of humor. The other one would be Mexico City, which is then the opposition of that with a huge city, but a city that I also like because there's so much culture and the fact that it's really a city with 30 million people counted, so, probably more, and I like the fact that it is spread out. GW: You are speaking of Belgium and your choice to stay here but then there is this division within the context of Belgium between the Flemish and French, which has been going on for a while, right? LT: Oh, that's for centuries basically, yeah. GW: And you are Flemish? Is that right? LT: I am Flemish because I am born here [Antwerp], on the Flemish side. My father was Flemish, also from Antwerp, and my mother was Dutch. So . . . yeah, of course that is part of your identity, but to go as far as to tear up the entire country, which is already that small, which is also quite, I mean it's not, it will not have huge consequences for Flemish people with a lot of money, it will just have huge consequences for people that just work and their social security. With a party and a leader that is blasting out populistic whatever and also not really the experience of being a real, I mean, in place politician. So I think that is all very, very, all based upon just the idea of an identity which is not, I think, a good way to do anything with politics at all. I mean, it goes, it's irrational, and so is also this feeling. To explain this is much more difficult than to explain normal nationalism like in Holland because this [Flemish nationalism] has a history, and this history goes deep down, and it goes over two World Wars, and the first Flemish activism was born in the First World War and led by French speak[ers] because all intellectuals were French speaking. The names of the streets here at that point were still first French and then Flemish. My father got a fine when he was playing on the playground and spoke Flemish. So, all those things go back, but my grandfather was in the trenches and he got totally disgusted and therefore became a Flemish activist because, although of course he understood French, a lot of the farmer boys didn't. So, [there were] a lot of needless deaths, going the wrong direction because they just didn't even understand [French]. Out of that there was a Flemish group of intellectuals that grew that were actually pacifists. 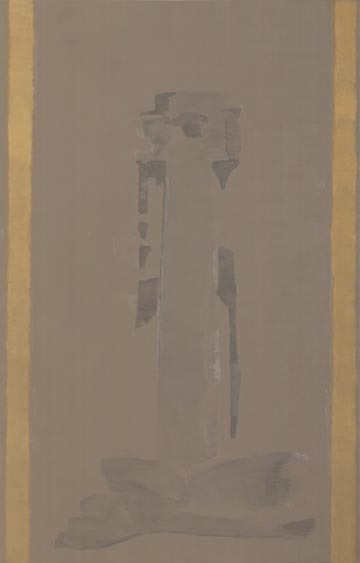 They created a monument, which I also painted, The Iron Tower [Ysertower or IJzertoren] that between the two World Wars became part of the New Order groups, you know, the fascist element that came up. . . and then, of course, there was a collaboration in the First World War with the Germans. Because of the closeness of the entity of the Germans and even also in the language, the first Flemish speaking university was born, the one in Ghent and the second university, that was also a large collaboration [with the Germans]. Of course the French-speaking [Belgians] also collaborated, but of course they emphasized even harder on the Flemish side because after the Second World War there was no Flemish bourgosie to talk of. It was still a French speaking class. So, thatâ€™s the history thatâ€™s heartfelt. A lot of these Flemish people, or boys, or whatever, went into this collaboration because there were food shortages. There were several reasons. The priests were preaching against Bolshevism. A lot of them were seriously misled. But this all, and this also out of this type of background, that this nationalistic action comes [now]. So this is all fed off of and mixed even more and more irrational because after all these years, and especially after the boom in the 60's, the biggest entity in this country is speaking Flemish. The richest people in this country, not the richest but in terms of economics, in terms of culture, in terms of whatever you can think of on top of it. So, there is no need for this [Flemish] minority complex anymore. It's still, it is sort of like . . . this is the unexplainable force behind it and that's why it has a story which makes it, of course, very pliable to a larger public and the fact is that the left side has always constantly underestimated populism as a political weapon which, of course, it always is, and then this is now a problem. We will see how it will be played out because the reality of it is something played out in a totally different way and especially also then the game, of course, the unfortunate moment in which Europe finds itself in right now with a double crises. We have an international crises but you have a crises in Europe. So all those things feed into that and establish it. Not only here but even in Holland thereâ€™s already this rumor that they want to get out of the Euro zone or in Spain or whatever, which is insane, of course. This is, this is insane, this is not possible. GW: How has this conflict affected you as a creative entity? LT: I made one show which was really about that which was called Heimat, in '95 out of disgust for the fact that I live in a city, at that point, of a city that one out of three people voted for this right wing, then still you had another party but this one [was] a very right wing center for Flanz Black. So I made it a point to do it here because if I showed that work in New York it's just exotic, but here it made a lot of sense. Then I did just, with all the old symbols that I just wanted to get rid of basically, and bring them back. Strangely enough, that was reactivated, also, like with one painting of the Flemish flag was the show in Brussels, of course, that painting, yet again, but now you see the image in the street much more and more and more again and again. That's when I say an image can be political at a certain given moment in time actually. GW: Stepping forward a bit, I'm wondering what you are thinking about now? What is going on in your head? LT: Now I am actually, first of all I just finished off these works [gestures towards a stack of promotional materials for the Allo! exhibition. Zagreb, Croatia (2012)] and I still have to make an additional four works for the show in London which will have something to do with that maybe or also not, but they will be the prelude, actually, to the six major paintings of these and will also be the most, I mean like, uh, yeah [searching for the word], surprising because it's not really perceived as typical of my work. To work with that set of colors and that harsh a contrast. And for the rest I am working on a new, preparing, actually, a new show for Tokyo on which I'm working, which is going to deal with this whole idea of animation, which will go back to an element of type of imagery that is drawn, then reprocessed in a negative, then repainted, and so that you get this, and it has to be painted and it has to have that type of quality, together with the building over there [points to the architectural maquette of Kerry James Marshalâ€™s drawing]. This is a smaller but very concise show, also. GW: They will be painted works? GW: And the imagery will be more like the new paintings? 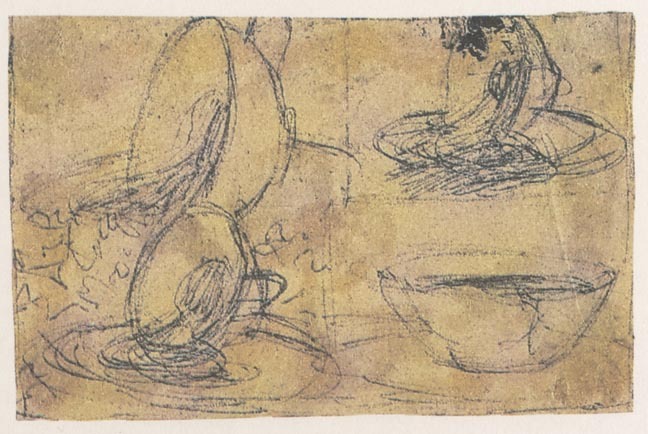 LT: No, the imagery will be a lot more linear than that [gets up and walks across studio to retrieve a set of drawings]. This is already from the drawings. It is all about the cup overflowing, itâ€™s going to be different colors though. See? GW: And these are your drawings? The cups. GW: How many works do you expect to produce? LT: From these there will be, it depends, because the gallery spaces are not really huge, normally, in ah . . . [Tokyo] but it will be five or six and then there will be maybe one bigger painting which will be the building, or two, but they will all, in that sense, maybe, draw from that one a little bit because they, again, they draw back on this time, much more the animation field, but they still draw back upon this sort of step in time where things move or crumble. Of course this is just hot chocolate in a cup, which makes it that it flows out very slowly, but then I have been looking at all these tsunami images, also. So, In a sense, it is this really strange thing which will bring up that with the building which is, of course, not destroyed, but will have an element of unease. And together with this straight forward evolution with the cup, we will sort of make the connection. GW: It is more tableware. GW: It is more tableware. Like the new prints and wall drawings you showed us earlier of your dinner plates in the Allo! exhibition. GW: And that is directly related to what is going on here in the new project? LT: Yeah, but in a different form of course, this is being a little more . . . but I also made some drawings--these are negative/positive drawings for this thing with Kerry James. And then we turned them into negatives with a real cup, tried to do that. GW: I'm interested in how humor and playfulness enter your work, because it is not overt but it seems like you do have a sense of humor and . . .
All images used courtesy of Luc Tuymans Studio unless otherwise noted. Special thanks to: PNCA, The Lemelson Foundation, Vanessa Van Obberghen and Modou Dieng for making this interview possible.